Here we share our plastic injection moulding expertise and knowledge to the best of our ability and give answers to the questions we are asked most frequently. I have a part that has an upper limit working temperature of 180C. Is there a suitable plastic for this component? I have a part that needs to be 50mm thick. It isn’t possible to injection mould something this thick, is it? I have a panel that is 250mm square that needs to withstand 1000kgs, what do you suggest? I have parts that will come into contact with acids, petrol and diesel and cleaning fluids containing alcohols. Which materials offer the best chemical resistance? I am designing an enclosure. What is the best method for joining the two halves? I am designing an enclosure that needs to be easily recyclable. It must be possible to remove one of the panels to replace a part. What should I consider? We have a cover that needs to have ribs. 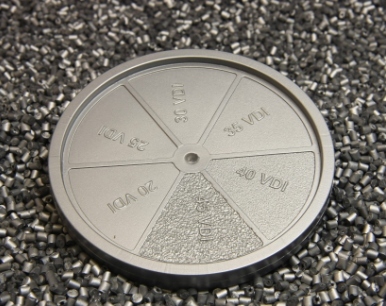 It is an aesthetic part so what steps can we take to ensure a good surface finish? We have a requirement for a handle but would prefer it to be one piece to cut down assembly costs. Is this feasible? We are looking for a lighting part that needs good clarity. What do you recommend? We are designing a new range of lighting and would like to use injection moulding wherever possible. Can plastics be used for the housings? We currently produce a part in a polished metal. To reduce cost and weight we would prefer a moulded part. What do we need to consider for a metallic looking part? One of our customers has asked if they can have a product produced containing an anti-bacterial. Is this feasible? We would like to produce a small box as a single moulding to avoid assembly. Is it possible to do this with some form of hinge? We would like a soft feel, rubber type part. 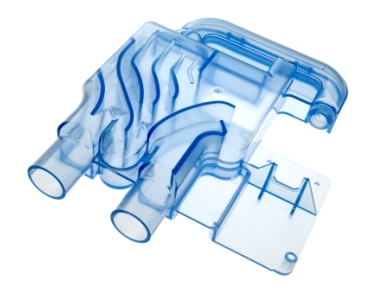 Is it possible to injection mould something like this or does it need to be rubber? We would like our plastic moulding to be as “green” as possible. Are there any “green” plastics? 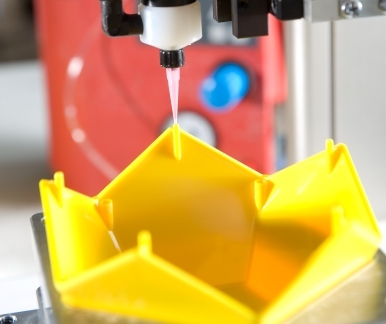 Is it true that injection moulding is only suited to high volume products? Relatively high temperatures need not be a barrier to using plastics. There are a few options available, the final choice dependent upon whether the elevated temperature is infrequent or continuous and any other properties you require. The cheapest option would be Nylon. An unreinforced Nylon 66 can have a Heat Deflection Temperature of up to 200C. Glass fibre reinforcement could lift this to 260C. There are more specialised high temperature grades which can withstand temperatures a few degrees higher still, up to 280C-300C. Another option would be Polyphenylene Sulphide (PPS) which is frequently used as a substitute for aluminium. The most widely available grades are generally glass fibre filled and may withstand continuous service up to 240C. Finally, towards the upper end of cost is Liquid Crystal Polymer (LCP). 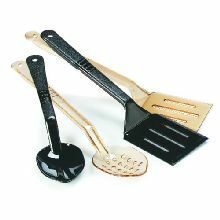 This material has been used for ovenware and can be used over a wide temperature range of -196C to +280C. Glass reinforced grades can withstand temperatures of 340C+. The options above do not cover all of the possibilities but provide a general overview of what is available. If you have a project requiring high operating temperatures contact us to discuss it further. It is a popular misconception that injection moulding is only limited to sections of 5mm or less. Here at Rutland Plastics we are specialists in the moulding of thick sections, in excess of 100mm in some cases. The shape of the part and material chosen are important factors in determining what is achievable. Some materials are not so suited to moulding thick sections, however there are ways of overcoming this. With thick sections, as the material cools, voids can form in the section (bubbles of varying size). These can weaken the part although this may not be an issue. One option to minimise surface imperfections and control the formation of voids would be to use a foaming agent. This will result in thousands of tiny bubbles being formed within the section, the size and number of these determined by the amount of additive used. Depending upon the design of the part and its usage, it may be possible to use Gas Assisted Moulding (GAM) to hollow out the thick section. This results in a very strong part with the appearance of being solid, it also has a generally good surface finish. 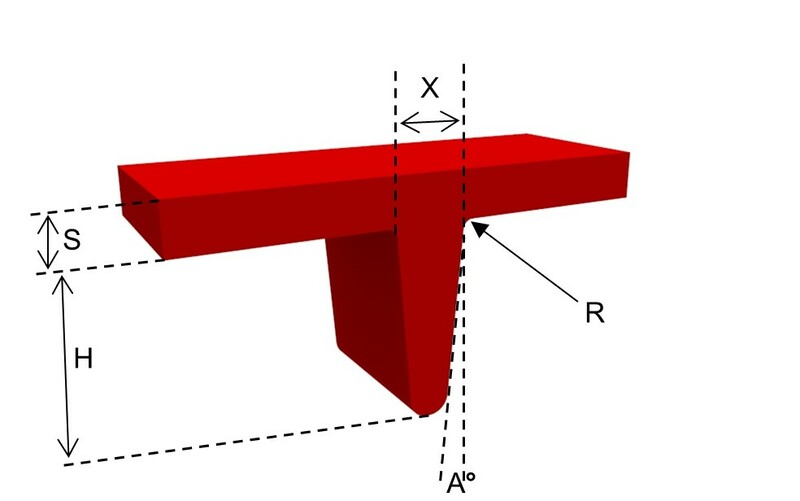 For more information on moulding thick sections please contact us. This is certainly something that can be achieved with an injection moulding. There are two important considerations in achieving what you require – rib design and material selection. 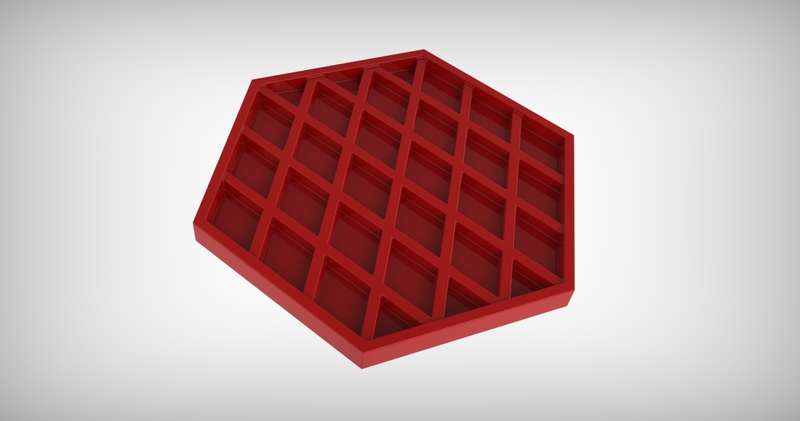 Whilst the number of ribs and their layout add stiffness and strength to an injection moulded component, it is the depth of the ribs which is just as important – deep ribs are stiffer than thick ribs. There are a number of considerations in rib design and our Design Guide has more useful information. Making a part thicker will not necessarily lead to a stronger part. In the case of polycarbonate, for instance, the optimum section for strength is 3mm-4mm, above this section the part would have a lower impact resistance. In terms of material selection, some thermoplastics are inherently stiffer and tougher and choice would depend upon the particular application. Glass fibre filled grades are generally selected when extra stiffness and strength is required. For help on designing your product please contact us. The resistance of the material to particular chemicals will depend on the concentration of the chemical and the length of time and the temperature at which the plastic will be exposed to this chemical. However, there are some general guidelines that can be followed. For acids, most thermoplastics have a good resistance with the exception of Nylon, Acetal, PBT and Polycarbonate at higher concentrations. For hydrocarbons, such as petrol and diesel, there is not such a wide choice of possibilities. Acetal, Polycarbonate and Nylon are good, Polyethylene and Polypropylene slightly less so. There are a number of choices if resistance to alcohols is required. Polypropylene and Polyethylene offer the best resistance with Polystyrene, Polycarbonate and SAN also good dependent upon the alcohol concerned. For example, Polycarbonate has good resistance to Isopropyl Alcohol but is poor when exposed to Methanol. The final choice will depend on what other properties are required. There are some more advanced, and therefore more expensive thermoplastics that offer excellent chemical resistance. For more information on the chemical resistance of thermoplastics please contact us. First you need to decide whether or not the join needs to be a permanent one. If there will never be a need to separate the two halves then you could use an adhesive or certain types of snap-fit. In most cases, however, you will need to take the enclosure apart for the repair or replacement of parts or batteries. In these cases the frequency of disassembly needs to be borne in mind. If it is very rare then self-tapping screws would be an option, there are special types for use in plastics. 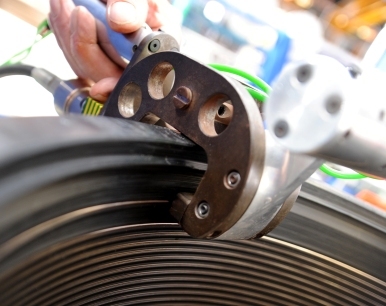 For more regular opening of the enclosure, threaded inserts could be fitted to ensure that the strength of the hold of the screws is maintained. Also, there are certain types of snap-fit that may be suitable. In all of the above, consideration needs to be given to the design of the bosses. Firstly, the hole must be of the correct size for the relevant fixing and, secondly, there should be sufficient section to provide the required strength. However, if aesthetics are important then this also impacts on the final design of the bosses. Whenever recycling parts it is desirable to just be able to discard them without any further action. This is usually unrealistic but any dismantling and sorting of components should be minimised. Clearly, the contents of the enclosure will need removing but ideally, the enclosure itself should not require any further disassembly. Therefore, threaded inserts should be avoided if at all possible as these are particularly difficult to remove. 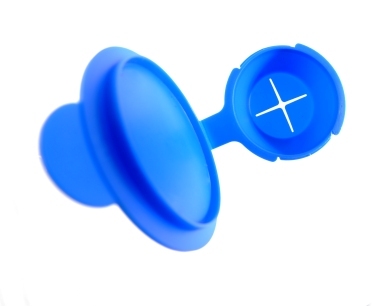 If necessary, self-tapping screws can be used as they would be removed anyway. Another alternative is the use of snap-fits wherever practical. These can even be used as a means of securing circuit boards, along with other approaches that do not require screws. If any form of bonding is required, polyester and polyurethane adhesives should be avoided. There are general guidelines in designing ribs for injection moulding. As a rule of thumb rib thickness should be no more than 50% of that of the main wall. Sometimes this is not possible and it is necessary to take an alternative approach. One solution is to use decorative features on the surface of the moulding to conceal the witness marks caused by sinkage of the material at the thick section where the rib joins the wall. This can be further disguised by the use of texturing on the surface. If the part is thin walled and has a gloss finish, such as a TV surround, then Gas Assisted Moulding (GAM) may be an option. 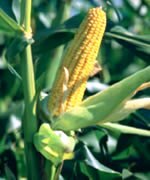 In some cases a chemical foaming agent may be used to achieve the same result. We have a requirement for a handle but would prefer it to be one piece to cut down on assembly costs. Is this feasible? It is certainly possible and would be an ideal application for Gas Assisted Moulding (GAM). Whilst it may be possible in certain circumstances to mould the handle as a solid part, it would have a long cycle time, be prone to distortion and would also be relatively heavy. Using gas to hollow out the centre of the handle, the part would be lighter and less prone to distortion. Some thought needs to be given to the design of the handle and material selection can also be important as some polymers are more suited to gas injection than others. Occasionally, there are hesitation or flow lines apparent on a part. These are usually faint and can be easily masked by use of a fine textured finish. The choice of material will depend very much on the particular application. Is the lighting for use indoors or outdoors? Could it be subject to damage? For clarity and long term weatherability Polycarbonate is generally the main choice, especially as it also has good chemical and scratch resistance. This material has high heat resistance and excellent toughness which is why it is used in applications where there is a need for damage resistance. Acrylic is used in many instances because it also has crystal clarity but superior UV stability and is usually lower cost. It is certainly possible and selection would be based on which properties are required. For example, high heat distortion, high impact strength, weathering resistance. It could be just one of these or a combination. For low heat ABS, PC/ABS or Nylon would be needed; medium heat would require Polycarbonate or PPO and for high heat applications it would be necessary to consider PBT, PPO, Nylon or Polyetherimide. ABS offers toughness, the ability to mould with tight tolerances with minimum warpage. PC/ABS blends combine the low temperature impact resistance of ABS with the high heat resistance and toughness of Polycarbonate. It has the ability to withstand extremes of temperature and rapid, repeated temperature fluctuations. Nylon provides high temperature resistance, high strength and toughness. Also resistant to weathering and offers low warpage. PPO is chosen for good load bearing characteristics and dimensional stability at high temperatures. PBT is used as an aluminium replacement in some applications because it can be easily coloured and offers cost reductions as there is no need for secondary operations. Once again, this material has good weatherability and high temperature resistance. 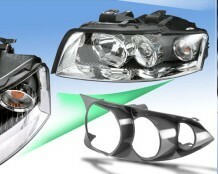 Applications include street lamp housings and spotlight bodies. PET is often used as a replacement for metal light housings as it offers corrosion resistance and with the use of colour and textured surfaces has a better appearance. It also has excellent high temperature stiffness and strength, together with good weathering properties. 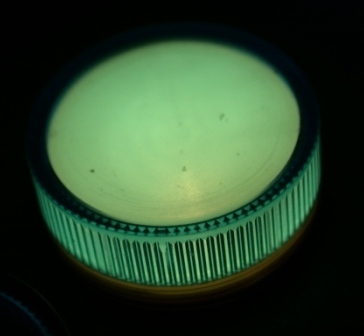 Also used for reflectors and bezels in both indoor and outdoor applications, and lamp sockets. Firstly, to get a really good metallic looking plastic part it is generally not possible to use an additive colour masterbatch. Although there are a number available they do not result in a metallic looking part. Celanese has developed a range of materials that are more metallic in appearance and it may be possible to use these in certain applications. The good news is that metal plating of plastics can be carried out on virtually all types of resin. There are various methods: vacuum metallisation, indirect metallisation, plating and painting. Plating has become more widely used by a variety of industries both to save cost and weight, the latter is especially important to the automotive industry. Fashion is also an important factor as we have seen with the recent trend towards ‘chrome’ small domestic appliances. For more information on plating of plating of plastics. In recent years there has been an increased awareness of the fact that everyday objects can support and spread bacteria. In the battle with this many new kitchen cleaners have been developed for use on work tops and other kitchen surfaces and anti-bacterial agents have been added to washing up liquids. More recently outbreaks of MRSA in hospitals have been highlighted by the media. Research has shown that potentially pathogenic bacteria can be found on pens, phones and door handles among other things. Hands coming into contact with these contaminated objects quickly transfer bacteria to another object. It is possible to add antimicrobials to any moulded object so reducing contamination risks. This approach is of particular interest to hospitals, food manufacturers as well as consumers in general. It should be emphasised that antimicrobials do not replace the need for good hygiene practice. The technology is based upon metal ions, one of the most effective being silver. These ions are stabilised and remain unreactive until coming into contact with another agent such as moisture. Rutland Plastics has experience of using a variety of antimicrobials. Certain antimicrobials active ingredients are always present at the surface so remain active. Many agents need regular activation, usually with washing. Furthermore, tests have shown that there was no reduction in efficacy even after 8 years with the more expensive silver based antimicrobials. Most other antimicrobials will see a reduction in effectiveness over time. For more information on antimicrobials. Plastics do allow us to design in such features and this particular feature is called a living hinge. This is a thinner section of material joining the two halves. In theory any plastic material that is flexible in thin sections can be used to produce a hinge. However, frequency of use needs to be considered when choosing the polymer to be used. Some parts will be assembled and then never parted again so any material that will flex without splitting will satisfy the requirements. If the hinge is going to be operated a large number of times then generally polypropylene is chosen as it has excellent resistance to flexural fatigue. There are also a number of design considerations. For more information please contact us. 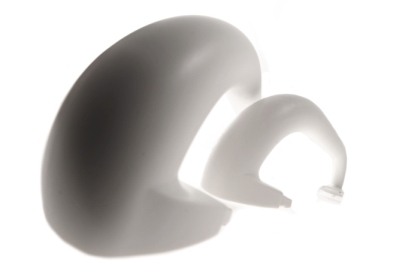 There are a number of flexible thermoplastics that can simulate the properties of rubber. Their hardness is measured in the same way as rubber and they can range from the relatively stiff grades through to extremely soft and flexible ones. Some grades are suitable for use as seals and gaskets and many can be moulded in a wide variety of colours. These polymers are referred to in a number of different ways dependent upon their formulation – PP-EPDM is a variant where there is a propylene content of between 25% and 55% by weight. If the rubber content of a blend is less than 50% then they may be referred to as Thermoplastic Elastomers or Thermoplastic Rubbers for example. For more information on these polymer types click here. You have two choices. Firstly, you can use a reprocessed grade of plastic. This is basically a material that has been recovered from plastic scrap of some kind – reject mouldings or reclaimed parts. This scrap is then reprocessed, sometimes with the addition of some virgin polymer, to produce a reprocessed grade with the required properties. 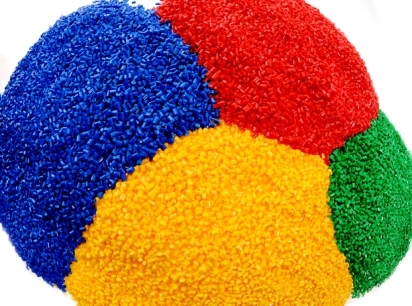 A wide range of reprocessed polymers is available although colours are sometimes limited. Secondly, there is an increasing number of Bioplastics being developed. These are produced from renewable sources that are generally plant-based as opposed to oil. 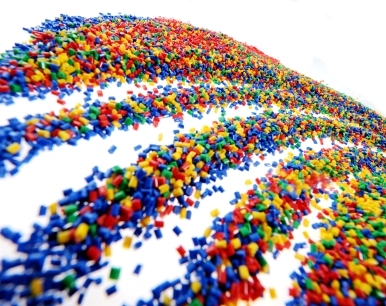 At the moment there is a limited choice of polymers for injection moulding but this is an area of future growth. 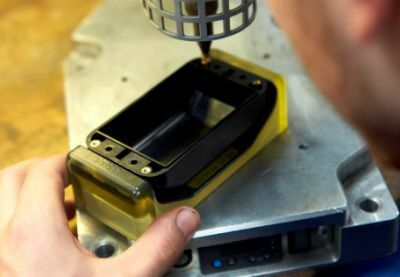 Rutland Plastics offers free, no obligation quotes so it costs nothing to discover whether or not injection moulding is suited to your application. For more information on materials and designing for injection moulding please contact us.